One of the easiest ways to increase the value of your home as well as improve its appearance and appeal is by installing, replacing, or repairing the siding of your home. In addition to giving your home a stunning appearance, siding installation and siding repair done to your home by the professionals at Chapo Construction Company, has another benefit; it protects the building’s exterior from the harmful and harsh effects of bad weather from seasonal elements of Mother Nature. Siding comes in 4 main types: wood, aluminum, vinyl and steal, each with its own unique set of advantages. For instance wood siding offers a natural beauty that other sidings are unable to offer; however, wood siding requires more maintenance and upkeep. 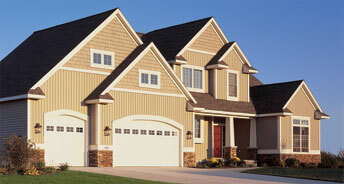 Vinyl siding is inexpensive and easy to maintain, it will not chip or crack and the paint does not peel. However, vinyl siding is not an insulator, so do not expect savings on your heating and cooling bills. Aluminum is more durable than both wood and vinyl; it is resistant to both fire and water, and it is lightweight which requires less maintenance. It is also a good insulator. The challenge with aluminum is that it can easily be dented by hail or debris from weather, so dent repairs might be a necessary expense at some point. The benefit of installing steel siding is that like aluminum, it is fire and water resistant, is thicker and more durable than aluminum, it will not dent easily, requires less maintenance, it doesn’t need to be painted, and is perfect for people who live in areas with changing weather conditions. However, this type of siding is more expensive than the options previously mentioned. Brand may also come into play for quality and the siding of choice for Chapo Construction Company is James Hardie. We choose this brand because it typically looks and performs better than its wood and vinyl counterparts. The benefits of having this brand installed on your home are that it rarely erodes, or warps, and never needs touch-ups. This saves you from spending money on painting siding that will most likely need to be replaced in a short amount of time.. You can forget about sanding, scraping and replacing cracked or rotting boards when you use this type of siding. We give you the best of both worlds: inexpensive options that are made using top quality, durable materials. When you choose to have the experts of Chapo Construction Company take care of your siding installation, siding repair, and siding replacement needs, you are choosing to work with a company that will provide you with nothing less than honest, trust worthy, reliable and dependable service that is affordable for all.